For the last few weeks I have been growing peas and rocket on the window sill of my spare room. My intention has never been to let these lovely plants reach full maturity, though. 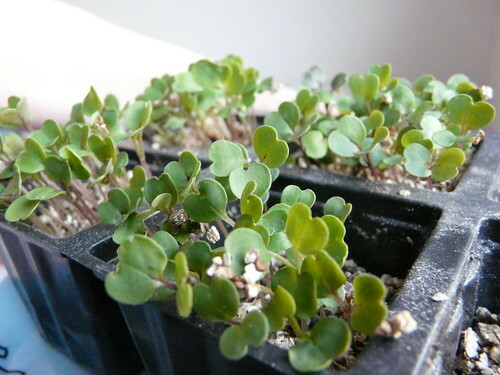 I’ve been growing them to eat as seedlings or microleaves, as they are known in foodie circles. D doesn’t approve. He thinks it’s mean to harvest plants in their infancy. He also thinks that it’s not financially or spacially economical. And I can’t really argue with any of these points. I do have to take a deep breath before snipping at the base of the young leaves and many costly seeds have to be sprouted in many containers to provide a salad for four people. A big sunny window sill – Of course, if you live somewhere warmer than here, a sunny spot in a sheltered area of your garden would be great too. Plastic containers and trays – E.g. yogurt pots, punnets, seed trays. Vermiculite or other seed friendly soil (check garden centre). 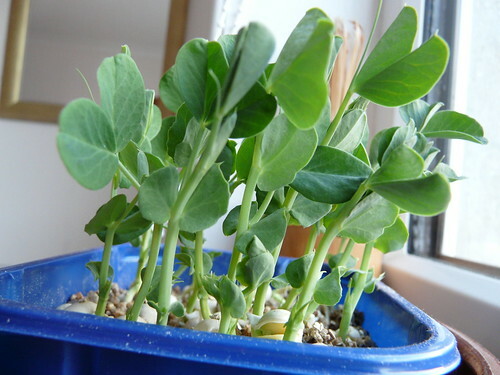 Seeds – rocket and pea seeds are my favourites but there are plenty of options. See here and here for a list of possibilities. Simple scatter seeds onto the filled containers and water daily from the bottom, letting the moisture soak up into the soil rather than rain down on the delicate seeds. Your micro-leaves will be ready to eat in 6 – 21 days time. Sow new seeds each week to ensure a constant suppy. For me, pea shoots are the best micro leaves going. That concentrated pea flavour is so fresh! I love it. They are so nutritious too aren’t they? I feel really vurtuous eating them. I’ve been meaning to buy a ‘sprouting kit’ that I saw in my local healthfood store but I can’t seem to get round to it. I also get various shoots and sprouts in my veg box (Abel & Cole) so that keeps me going. Alfalfa is another fave. Fabulous idea Wendy! I love pea shoots but never buy them when I see them in an air-freighted pillow pack. I hadn’t thought of growing them at home. I’ll try again this year but your leave tender tender are lovely!! 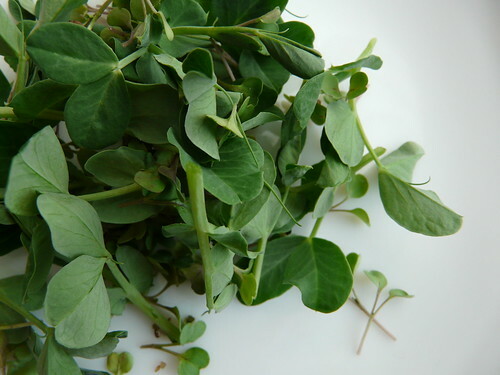 I love pea shoots, they are so sweet and tender! Helen – Pea shoots are my favourite too. And they’re so easy to grow too. Soak the pea seeds for a few hours first though. It helps them germinate better. Wendy, this is a briliant, BRILLIANT idea. Leaves and shoots this young have all their nutrients not only in tact, but in massive amounts. Good idea Wendy. I buy a bag of this stuff whenever I get to the monthly farmer’s market in Sydney. It’s expensive, but really peps up a salad. Never thought of growing them at home. never heard of micro leaves before – but am not a leaf person – I suspect I would like these as my favourite leaf is probably baby spinach – now I never thought of it as cruel before – poor wee things! Fantastic post! Those pea shoots look so yummy. I’d mix them with some feta cheese and balsamic vinegar immediately! Lucy – Take a picture when they’ve sprouted! Kathryn – I’ve never come across them in shops before but have had pea-shoots in restaurants before. Love the sweetness. Johanna – Baby spinach is my favourite too. Use it in almost all my salads. Rosie – There have been several article in newspapers recently about them and I too thought, why haven’t I been doing this all winter? As much as I grow things in pots, I agree with D…let them grow! But…since you mentioned PEAS, my favorite, I am going to have to try a pot of these. Yours look fabulous! Your ode to spring! Deb – Take a picture for us! I am going to have to try this! Oh how I love pea greens. YUM! Thanks for reminding people the delights of growing their own food. Christina – It was nice to be reminded myself. Karl – £9???? Jeez. Get those windowsills cleared! For good results don’t forget to add a liquid feed when you water the plants. This is not important if you are using compost as a medium. Perlite, vermiculite, rockwool etc are all sterile mediums, without feed your plants rely solely on the nutrients stored in the seed to grow (and of course sunlight). A good organic feed is worm wee, dilute 1:10 to water, there are also many hydroponic stores for manufactured feeds. Feed at least twice before cropping, your crop will mature faster and produce healthier plants.